Where's Yr Child is this LA-based irregular club / DJ collective involving Sun Araw's Cameron Stallones, ex of the NNF family. The name is a nod to this acid house classic. 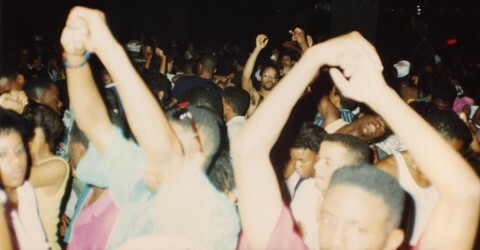 right now, along with the Paradise Garage shot, WYC have a picture of a mass of mostly white ravers. But generally the iconography at Where's Yr Child is black--supersharp dancers at various clubs from several decades ago, a picture of dancehall act Scare Dem Crew, a Rasta with enormous bulbous infolded dreads. And didn't I read that Stallones is actually making a record with The Congos? i wonder how he (and "they", in general) got into this stuff in the first place (meaning house, acieed, balearic etc)... most likely from a completely different route than contemporary club people get "there"... i.e. not from clubbing but from records, books, Internet deposits (Hot Mix 5 radio sets from Eighties Chicago, Baldelli mixes, Youtubes of classic jams). as the sample on that Ultramarine tune (forget which one) puts it "they're searching for spiritual reasons, they're looking for something more than this world has to offer"